Seeking relief, athletes are often directed to massage therapy to heal muscles after a workout. Powerful kneading feels great and works wonders on sore, stiff muscles and joints. Hydro-massage takes it a step further, for a much-needed edge. Here’s how a dip can improve athletic performance. Athletes who take the time to heat cold muscles before training enjoy increased joint flexibility, improved range of motion and an easier, more enjoyable experience. With jets positioned to reach all parts of the body, a hot tub loosens tight muscles in preparation for athletic activity. Speed Recovery Time Soaking in elevated heat increases circulation, providing the body with important oxygen and nutrients for faster recovery. 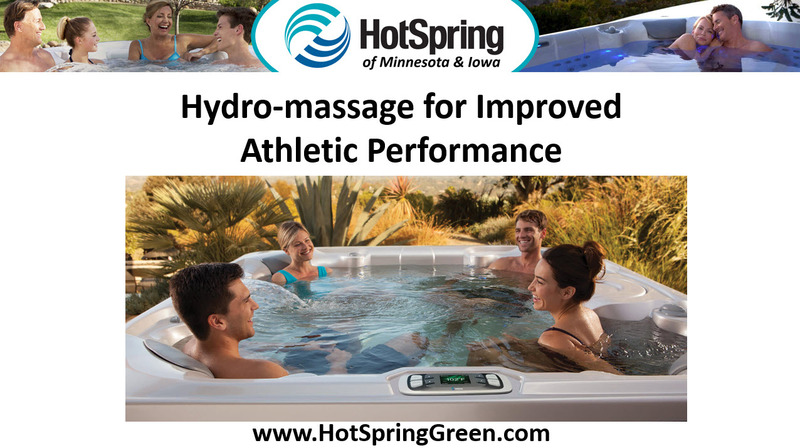 In addition to speeding recovery time, regular hot tub use improves muscle tone and decreases muscle deterioration. After exercise, or any time the mood strikes, a quick soak with massaging jets targets pain and discomfort, relieving sore, overworked muscles and joints on contact. Energized streams of water loosen tight muscles, stimulating the release of endorphins—the body’s natural painkillers.